Professional CD-I players were sold only to developers and to be used on digital kiosks. Other developed units were probably made using a PCI or ISA card design. They weren't available for customer users. The most famous Professional CD-I player ever made: one for developers. With built-in Disk Drive. A professional CD-I player. Nothing more. Power supply: Voltage: 100-240 VAC, Frequency:50-60 Hz, Power consumption: 20 W approx. Cabinet: Material: PS front panel, Metal case, Dimensions (w x h x d): 435 x 85 x 2920 mm (17 1/8 x 4 1/8 x 11"), Weight: 4 kg approx. Accessories: MMC unit (Europe, USA), AC cable (Europe, USA), IR remote control + batteries (Europe, USA), Euroconnector cable (Europe), Stereo Audio cable (USA), Video cable (USA), User manual (Euope, USA). Works with all wide (16:9) and standard (4:3) format TV receivers , and all stereo systems. A unique system to implement custom specific requirements such as disc protection, disc lock-out, access control and start-up messages. The most recent Professional CD-I player for Point-of-Information, Point-of-Sale, Training and Education use. Power supply: Voltage: 100-240 VAC, Frequency: 50-60 Hz, Power consumption: 20 W approx. Cabinet: Material: PS front panel, Metal case, Dimensions (w x h x d): 435 x 85 x 290 mm (17 1/8 x 4 1/8 x 11"), Weight: 4 kg approx. Package contents: MMC unit, AC cable, IR remote control, Stereo audio cable, Video cable, User manual, Technical manual. Based on Philips industry-leading Compact Disc technology, this controller is an excellent solution for interactive dialogue at Point-of-Sale and Point-of-Information kiosks, as well as for training and education. The controller shares interfaces with and connects to any standard TV receiver and audio system. With its extremely easy installation and operation via a simple pointing device constitutes a leading multimedia platform. This MultiMedia. Controller can be hooked up to control one or two professional DVD players combining DVD's stunning Audio/Video qualities with CD-i's interactivity. The serial communication supports the high modem speeds to allow for FTP data transfer from an Internet site. A printer interface provides allows for a written confirmation when required. A unique system to implement custom specific requirements for pointing device handling, disc protection, disc lock-out and access control of settings and intermediate results. Follow-up to the 605 Professional CD-I player. It could be connected to many parallel devices like a ZIP drive. 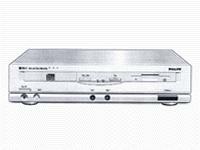 At least one more professional system was available: CDI 630 but I have not informations: it is mentioned on Philips CD-I FAQ. If you have info or pics of it let me know: I am very interested on it!